Some SW 4 color specimens from the Darai-Pioz Glacier, Tajikistan. have white fluorescing Baratovite, Pink fluorescing Agrellite, Magenta fluorescing Microcline, and an unknown fluorescing Green (hyalite?). A brief but distinctive orange flash is seen before the magenta luminescence (typical of Mn activator?). RE elements (RRE2+ and RRE3+) replacing Ca2+ are suspected as activators. Also Mn and Fe. Fluorescence: pink LW after Robbins and other authors, clearly visible with pointer-laser @405nm. As with other minerals activated by RRE, the shape of the spectrum is strongly influenced by the resolution of the spectrometer because RRE have a lot of very narrow peaks very close from each other. 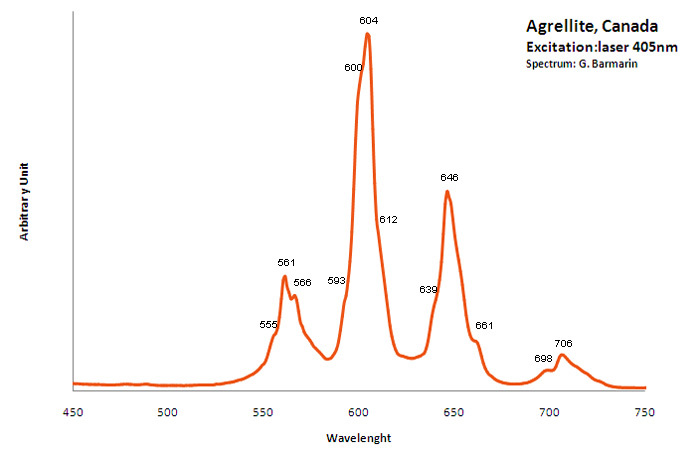 If the resolution of the spectrometer is not sufficient, the pikes are agglomerated in larger entities. 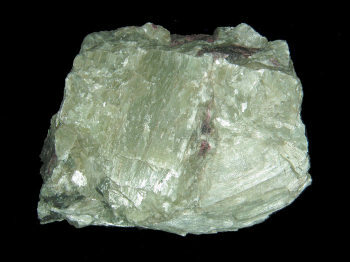 There is sometime a green fluorescent mineral accompagning agrellite. It is sometime reported as thorium activated calcite (???) that will glow green sw and mw whitish green lw and will phos under all 3 waves. Sometime thorite coating are invoqued to explain the green fluorescence in specimens from Kipawa. 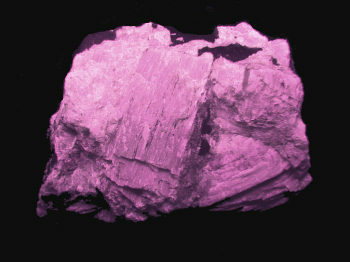 Albite fluorescing red SW is also often present.